Good morning Clemson Girls! You know we're a big fan of giving you, our fabulous readers, free Clemson swag from the best companies at every chance we get. And today is no exception. 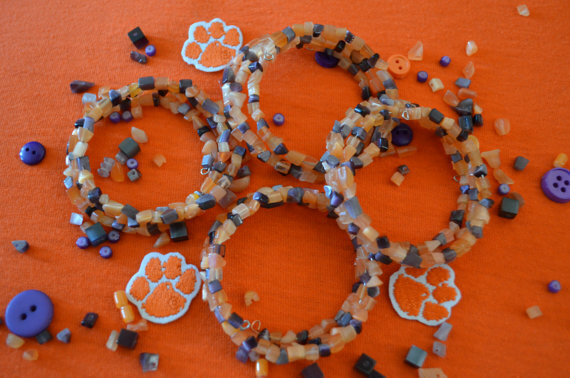 Today we have a great giveaway from Green Tiger Jewelry - a Clemson alum owned Etsy shop that specializes in handmade jewelry...with of course lots of great Clemson colored designs! Green Tiger Jewelry is offering all Clemson Girl readers a special discount code - use promotional code CLEMSONGIRL to get 10% off your total purchase! Green Tiger Jewelry would also like to give one very lucky Clemson Girl this beautiful orange and purple memory wire bracelet. Deadline for all entries is tonight at midnight. We will draw a winner at random and contact the winner by email tomorrow, Sept. 27. The winner will have 48 hours to reply to our email or we will draw a new winner. 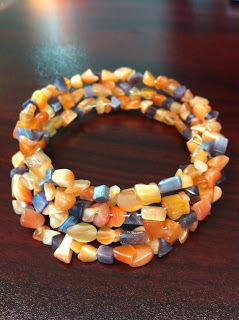 Many thanks to Green Tiger Jewelry for sponsoring today's giveaway!